Charlie Peters​ ​is​ ​an​ ​English​ ​writer​ ​and broadcaster based in Scotland. He is in his final year of reading philosophy at the University of Edinburgh. 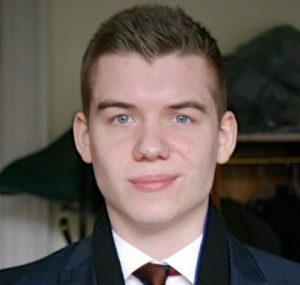 Interested​ ​in​​ ​conservatism, ​education, security​ ​and​ ​architecture, ​ Charlie has​ ​written​ ​for​ ​​the Telegraph,​ ​​National Review,​ ​​spiked,​ ​​Quillette ​and CapX.​ ​He contributes to​ ​Sky​ ​News​ ​and​ ​BBC​ ​television and radio. Charlie​ ​is​ ​a​ ​reservist​ ​in​ ​the​ ​British​ ​Army, serving in the Intelligence Corps.